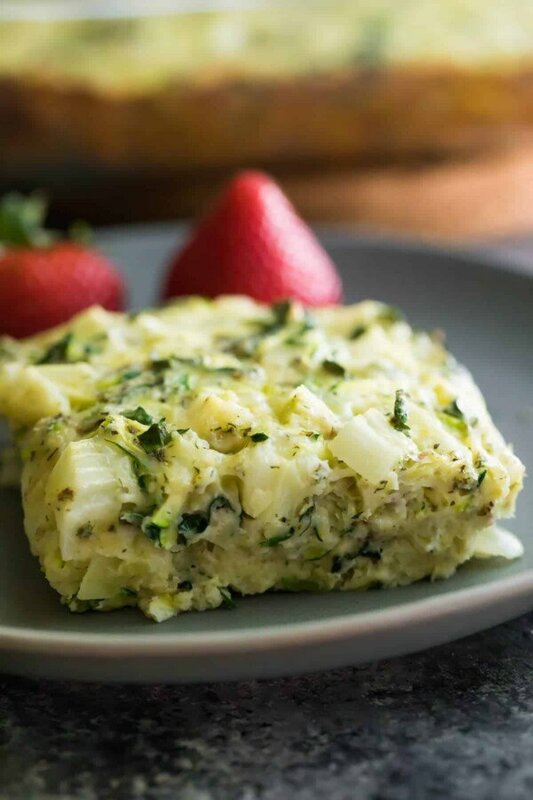 Herb zucchini & kale egg bake that you can make ahead and store in the fridge or freezer for a healthy meal prep breakfast on the go! Packed full of protein and veggies to give you a healthy start to your day. I love eggs. But I don’t love cooking eggs (or anything else for that matter), first thing in the morning. Priority #1: coffee. Priority #2: need food fast! And don’t get me started on flipping omelettes. My omelettes always always always end up scrambled eggs. Are you the same? So suffice it to say that I am not a big egg eater, unless we go out for breakfast. And then I always think ‘we should eat more eggs’. 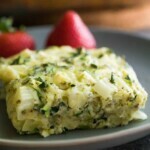 Today’s herb zucchini & kale egg bake is my solution to the egg issue. Make it ahead, bake it up, and you can store it either in the fridge or freezer for an easy and tasty breakfast. PS- no flipping required. Hallelujah! 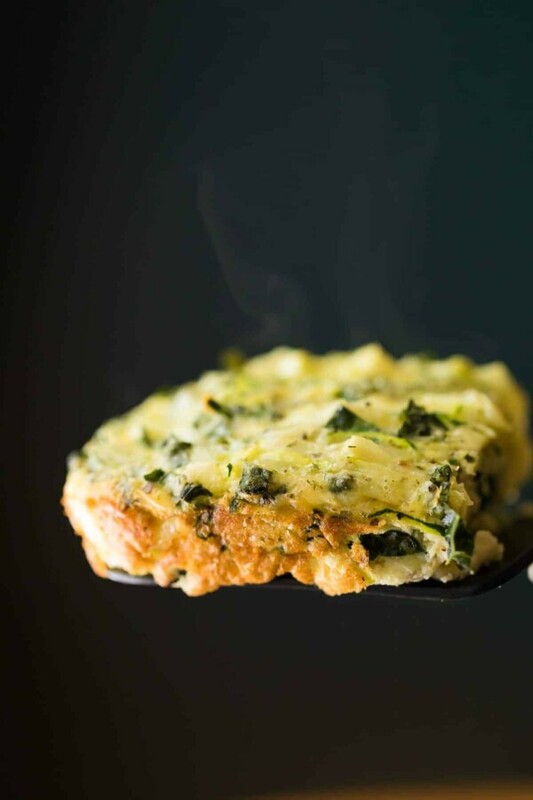 Not only is this herb zucchini & kale egg bake recipe fridge and freezer-friendly, but it is good for you, too! Packed with protein to keep you full, and veggies to nourish you. And only 240 calories per serving! 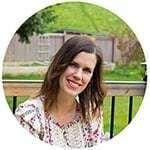 Now I had the same ‘juicy’ issue with the first batch of this recipe as I did when making these 7 Healthy Breakfast Egg Muffins…as in the eggs ended up a bit liquidy when re-heating. It’s just going to happen when you pack 3 cups of veggies in. Solution: 1/2 cup all purpose flour. Can you leave it out? Absolutely. So long as you’re OK with a certain amount of liquid escaping from your eggs. *even with the 1/2 cup flour, this recipe is still pretty low carb with only 12g per serving. 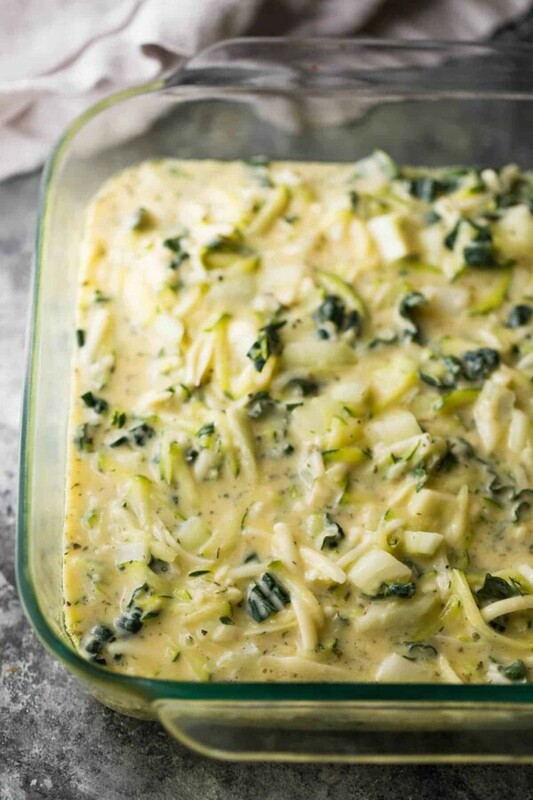 Now I prepped this herb zucchini & kale egg bake in an 8×8 inch baking dish, but I bet doubling it and baking in a 9×13 would work well for a crowd. I plan on testing this out soon and will update the recipe with the bake time. You could certainly replace the veggies with what you have on hand: broccoli florets, cut really small, spinach, bell peppers, cauliflower rice, you name it. This recipe is super versatile and perfect for cleaning out your fridge on meal prep Sunday! 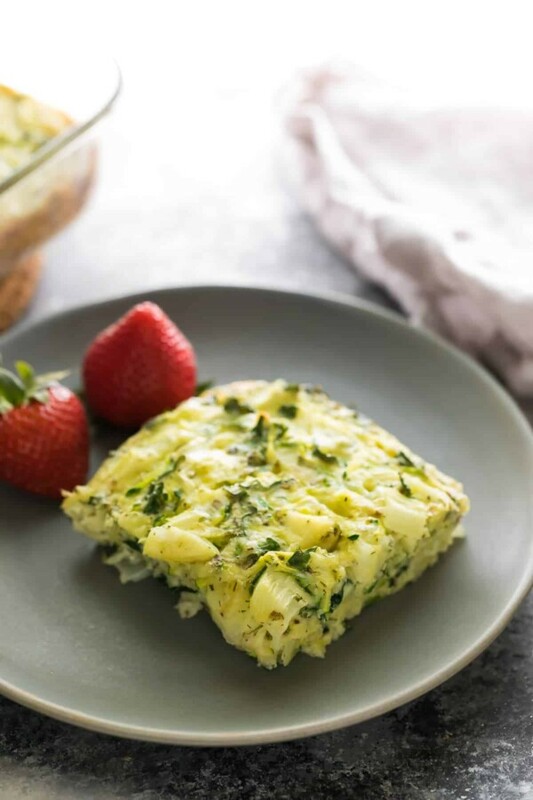 PS– I happen to think this herb zucchini & kale egg bake would make a pretty fantastic filling to one of these healthy freezer breakfast sandwiches if you are looking to mix it up! Spray a 8 x 8 inch glass baking pan with spray oil and set aside. In a large bowl, combine all ingredients, mixing well to combine. Pour into the baking pan and bake for 30-35 minutes, until center no longer jiggles and a tooth pick comes out clean. To store:Store in sealed containers in the fridge for up to 5 days. Store wrapped in plastic and in a larger bag or container for up to 3 months. To re-heat:Thaw overnight if frozen. Heat in the microwave in 30 second increments until heated through. I’d like to confirm your nutrition facts. You say it’s 12g of carbs, but based on the posted facts, it’s 19 net carbs. Please confirm. Looks like I will have to recalculate! With the flour this recipe has 19 g net carbs, and without, it has 7 g net carbs. Hope this helps! Not sure where you are getting the 12 g carbs from? I noticed in the “tips” section you said you used your Pyrex 8 inch pan but in the recipe instructions you use a 9 x 9 pan. I was curious which one you used. Also, would a metal pan work just fine? Thank you! Ack! You are right! It is 8 inches. Thanks for noticing! If you use a metal pan, be sure to grease it well and check on it sooner as I’ve had issues with eggs over-cooking in them and sticking to the bottom.